Un résumé français de cette présentation est disponible ici. When soundscape composers, documentarians and artists work with soundscapes, they are expressing relationships to the place of work and its inhabitants and visitors, to the sounds listened to, recorded from or projected into the place, and to the audience of the work. Each time a soundscape composer designs a soundwalk or a theatre piece, an installation or broadcast work, relationships with the world are expressed through how the maker treats the place, the sounds and the audience. Does the maker want to reveal particular sonic aspects of the place as it is, as it used to be, as it might be? Does the composer want to create an ideal place through sound and if so, what are the characteristics of this imaginary place and what ideas and values inform this utopic creation? How does the composer treat the sounds? How prominent are the composer’s treatments in relation to the sounds originally heard in that place, and what are the characteristics of this electroacoustic ecology? What are the dominant and masked sounds in the piece and how do they interact? What connections are there in the work between what is heard in the piece and the place of recording? Does the maker imagine the audience as deafened into numbness and needing to be awakened to true listening by the composer or soundwalk leader’s approach to the soundscape? Do we imagine the listener is ignorant and needing enlightenment? Do we think of the listener as possessed of original and unusual ways of listening, contributing to an expanded awareness of how to work with soundscapes? What are the ethics of this expression, and how are these ethics informed by underlying ideologies of sound, of sound production, and of sound ecology? I would like to consider one well-known idea in sound ecology. One fundamental value that is consistently ascribed to soundscape work and sound ecology is the ideal of the hi-fi soundscape. I think it would be worthwhile to think a bit about this term, where it comes from, what baggage it brings along with it, and how it might inform soundscape work. The concept of high fidelity emerged in the early twentieth century in both communication theory and audio production practice, as a marker of the degree to which an audio (or other kind of) system faithfully reproduces a signal. In order for a sound to be reproduced with high fidelity in the studio, it is usually isolated from other sound sources, electrical noise is reduced and contextual noise is blocked, and then individual sources are layered and mixed to create an illusion of a musical experience such as that in a concert hall, or to create a layered narrative such as a sound documentary or soundtrack for a film. Each sound in this process is conceived of as an individual and precious signal that needs to be isolated from problematic noise in order to approach authenticity of representation, to sound as much as possible like an idealized source. Emily Thompson, in The Soundscape of Modernity, argues that this move to think of sounds as signals implies a change of listening criteria, in which clarity and control become paramount. Clear, controlled, signal-like. The concept of the hifi soundscape engages with this idea of sound as signal, as an ideal of clarity and clear communication to be searched for in preferably natural quiet soundscapes, while lofi noisy soundscapes are associated with modernity and busy city life. In the Tuning of the World, R. Murray Schafer defines a hi-fi soundscape as an environment where “sounds overlap less frequently; there is more perspective—foreground and background” (1977, 43). The solitude of the pasture and the wilderness is romanticized and desired in contrast to the familiarity and close quarters of daily, noisy urban life. Escape to the wilderness, for those who can afford the time and money away from the city, is understood as paramount in order to free the ears from their daily assault of domestic noise. This urge to commune with Nature is similar to that found in the tradition of the Romantic Landscape, in visual art. Thomas Cole and other American landscape painters of the nineteenth century, and Canadian painters like the Group of Seven in the twentieth century, considered Nature a wellspring of inspiration and solitude, where the individual voice of the artist could be heard away from the distractions of the city. Canadian author and critic Northrop Frye argues that a specifically Canadian approach to the romantic landscape is one associated with a far horizon and a long-range perspective. “The sense of probing into the distance, of fixing the eyes on the skyline, is something that Canadian sensibility has inherited from the voyageurs. It comes into Canadian painting a good deal, in Thomson whose focus is so often farthest back in the picture … It would be interesting to know how many Canadian novels associate nobility of character with a faraway look, or base their perorations on a long-range perspective.” (1971: 222-223). This long-range perspective is also found in the ideal of the hifi soundscape. By referring to the hifi soundscape as an example of an ecological soundscape, are we shaping soundscape studies through a particularly northern and isolationist framework? Is this what we want? The hifi thus gave access to unusual sonic experiences, allowing the enthusiast to leave their home behind and experience another environment through sound. The concept of the hifi soundscape has been reproduced in many writings about soundscape studies as an idea fundamental to acoustic ecology. In the sound ecology formulation, the hifi soundscape is most closely associated with sparse wilderness and rural landscapes like mountaintops and pastures, and the lofi soundscape with urban and industrial soundscapes. Yet if hifi and lofi is to delineate a boundary between modern and pre-modern, industrial and natural, city and countryside, what do we do with noisy nature and sparse city soundscapes? There are many natural soundscapes dominated by overlapping sounds: noisy environments that are very dense and without clear perspective. There are also lofi urban soundscapes that people actively seek out for various reasons, that have a social function in the urban ecology. A waterfall, the tropical rainforest at night as we just heard — or a bird nesting site, or a windstorm. These are all lofi and ecologically sound, ecologically important environments in wilderness settings, with many overlapping sounds of life. Is overlapping bad, and unecological? Does signal articulation indicate a healthy acoustic ecology? Could clear signal articulation sometimes reflect an unhealthy system or damaging sound ecology? What happens when a hifi soundscape is imposed by some people on others, not through malice because of a well-intentioned belief in the efficacy of silence to facilitate communication with the divine, to increase communication with an inner voice of penitence and spirituality, the still, small voice within? Consider the case of prison reform in Pennsylvania, and the concepts of solitude, silence, and controlled acoustics introduced by Quaker reformers. This situation raises several questions for me in relation to the idea of a hifi soundscape. Is it good signal to noise ratio that we are searching for, or a particular quality of silence that is comforting and inspiring, not oppressive and suffocating? Can we hear oppression or comfort or the space for inspiration within a particular hifi or quiet soundscape and how would we characterize that? What are the differences among experiences of silence in a Quaker meeting, with several people sitting in silence together and mentally holding loved ones in the light of inspiration; the silence of a lonely prison cell where solitude and penitence is prescribed by those very same well-intentioned Quakers; the silence of a group of refugee families moving quietly through the jungle to avoid the gunshots of the army; and the silence of a comfortable retreat in a remote rural soundscape with birds singing, perhaps cowbells in the distance? How does the emotional and political context of the hifi soundscape affect its perception and value? How much silence do we want, under what conditions? Who is in control of the silence? Who can afford it? Who must maintain it on pain of death? In both sound recording and sound ecology, the ideal of hifi seems to be related to ideas of authentic experience, of solitude, and of control of the environment. The authentic mountaintop of the hifi sound system and the idea of the hifi soundscape are both represented as retreats from the noise of urban domesticity. Is this what we want to represent to people? That in order to find ecological soundscapes, one must drive away from the city? That quiet, isolated sounds are ecological, and overlapping sounds unecological? What happens then with bird nesting colonies and tropical rainforests? What happens with urban situations that are quiet? Do some of us feel a quality of reflective cleansing similar to silence through immersion in details of the noisy sounds of surf, restaurant cutlery or passing trains? Or can we consider the importance of urban situations where the noise is productive and helpful to daily life? The third excerpt that you heard in the sound example a few moments ago is from David Paquette’s study of the neighbourhood of Commercial Drive in Vancouver. Here, an extremely noisy restaurant environment is considered familiar, vibrant and friendly by listeners. The overlapping sounds of voices and cutlery in a reverberant space provide an accompanying drone for the exclamations of the friendly owner, and each private conversation is surrounded by a wall of sound that ensures privacy. Here, lofi and hifi seem less important as categories, and how the listeners approach, move through and use the space is more telling. What kind of soundscape art is suggested by the hifi – lofi distinction? It would seem paramount in this structure to give people experiences of hifi soundscapes. People would need to be transported away from domestic urban noise into the rarefied atmospheres of wilderness settings. But when soundscape events are planned in remote locations that require participants to use cars to get there, such choices have political implications: as Alexander Wilson (1998) points out, access to wilderness parks is the privilege of the middle class who can afford to buy or rent cars. He notes that in some cases, roads to parks were designed with bridges so low that they excluded buses, a move which explicitly kept out those who do not have cars; while in many others there are no public buses or trains that will take people directly to parks. Or hifi soundscapes could be preserved by field recordists and composers who would travel around the world finding and recording them, then these recordings and compositions would be made available to local people in urban centres, who would enter insulated and engineered hifi listening spaces, or use headphones, to transport themselves into the hifi soundscape. But what are the costs then of always thinking of the ideal as other, as unattainable unless with an engineering of space, the creation of an electroacoustic alternative, or far-flung travel? What would happen if we consider a concept from ecology as a metaphor to think with? The concept of ecotonality seems rich with possibilities. The ecotone is a marginal zone, a transitional area where species from adjacent ecosystems interact. Some species in an ecotone are from neither ecosystem but thrive here and do not live elsewhere, because of the rich possibilities contained in such regions, which have characteristics of more than one ecosytem. Beaches and the edges between forests and grassland are both examples of ecotones, or the stratified fresh and salt waters of the confluence where river meets sea. The focus here is on the sonic qualities and relationships of the sounds as they were gathered by Ferrari on that day. The process of change in the piece is accelerated and made more audible through time-lapse phonography. Origins are not erased here: we can hear that this is daybreak at the beach, with a compression of time that shifts the experience into a heightened awareness of time passing, that brings heightened attention to the ecotonality of that place. What are the possibilities of an ecotonal sounding art? What would it mean to listen for characteristics of ecotonality in a soundscape rather than searching for single clear signals devoid of problematic noise? Instead of banishing sounds that overlap and rub up against each other, what would it mean to pay attention to how sounds overlap, to how they rub up against each other, in whatever context? The liner notes for Ferrari’s piece refer to the experience and imagination of the listener, which I also want to think about employing the idea of ecotonality. We could imagine the listening horizon of each listener, including the sound maker, as overlapping adjacent listening ecosystems. The act of listening to a piece makes a space of meaning where these systems overlap. Consideration of the ideas of many listeners creates a complex system of overlapping listening horizons that can provide more nuanced perspectives on the piece and its sonic meanings. In this description it sounds as though the composer has juxtaposed a number of disparate environmental elements and constructed noise components in a manner which emphasizes sonic manipulation, and pays less attention to the place of recording. I have argued elsewhere that this misinterpretation seems to be based in accepted knowledge about what constitutes electroacoustic music. Since the norm in acousmatic music is that sounds are to be treated as sound objects, as discrete entities like the sound signals of the recording studio, then it would make more sense to hear a tape piece as using sound objects and noise components that are selected, organised and collaged together, rather than hearing it as an approach to framing and condensing a recording of an existing sound environment. The writer makes sense of it according to normative electroacoustic practice. This is a disciplinary listening, defined by disciplinary perspectives and ideologies of composition, manipulation, and mastery. Eric Drott (2009) has argued recently that Luc Ferrari was attempting, through Presque Rien No. 1, to advocate for a new, more inclusive and democratic approach to sound art, one which worked against this focus on manipulation and virtuosity. “As the soundscape deteriorates, so awareness of the subtleties of environmental sound has withered in proportion. As a result, the meanings sound holds for the listener in contemporary soundscapes tend to be polarised into extremes — “loud” and “quiet”; noticed or unnoticed, good (I like) or bad (I don’t like)” (Wrightson 2000: 3). Is this how people listen in the contemporary world, in polarised terms devoid of nuance or poetry? Is this polarised approach to listening described here influenced by the polarised terms associated with acoustic ecology, such as hifi and lofi, natural and industrial, silence and noise? I would like to consider a couple of examples from a recent installation on sounds of home. 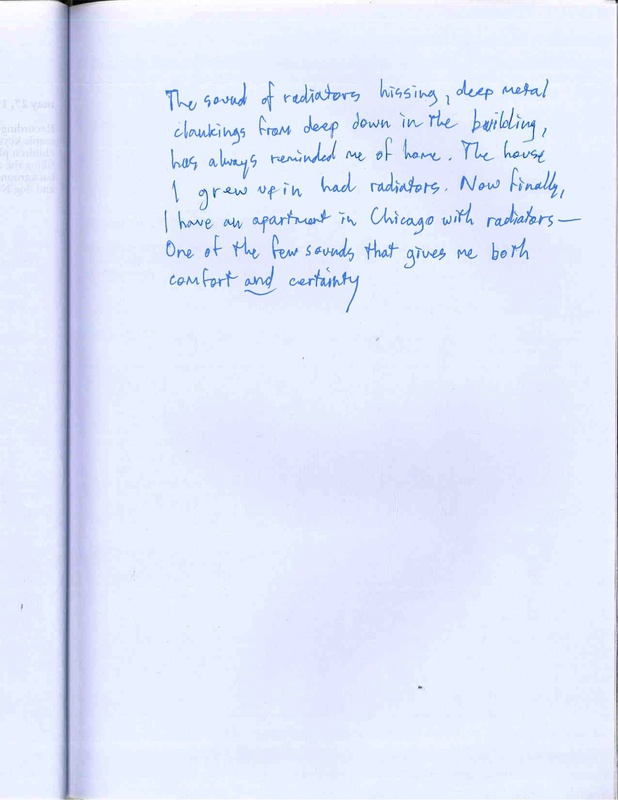 Listeners were asked a number of open questions about sounds of home in the installation book, an essay on sounds of home was provided for people who wanted to read more, and listeners were encouraged to respond in any written form that they wished, from lists to poetry to descriptive prose to drawing. This listener remembers the sound of radiators hissing from previous homes, describing the deep metal clankings of the sound and noting that their present home has this sound. Then the emotional tone of this experience is described as one of comfort and certainty. This is a complex and thoughtful response that indicates continued listening to this sound and thinking about its meanings in the life of the listener. The book that was created for people to write in had an open format that encouraged people to interact with each other as well as with the soundscapes. 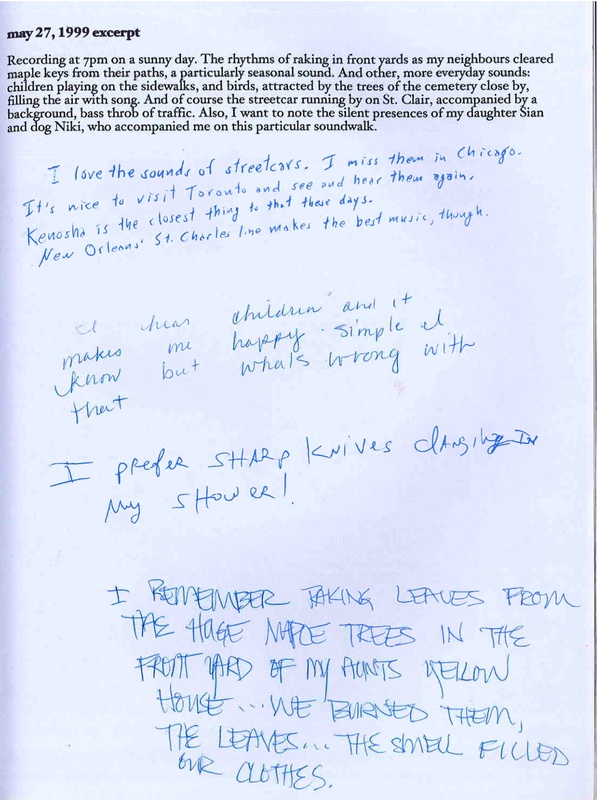 On this page, one listener speaks of their love of streetcars, with a preference for a particularly musical line. Another expresses a preference for the sounds of children and somewhat anxiously asks what is wrong with that, indicating their understanding of the controversy over domestic noise, the way that domestic sounds such as those of children are understood as a problem (as in the well-known saying that children should be seen and not heard). The anxiety of this listener seems justified when reading the comment underneath in which another listener expresses a preference (ironically no doubt) for sharp knives clanging in the shower, an oblique reference to Hitchcock’s Psycho. Here, even a polarised preference like that for the clanging knives over children’s voices is thought-provoking for the maker of the soundscape installation. These comments indicate profound underlying attitudes and ideologies that cannot be ignored by the soundscape research-creator. The final comment indicates the importance of links between senses, as the sound of raking evokes a memory for this listener of another raking experience and how the smell filled their clothes. These listening responses indicate different kinds of engagement and approaches to listening. Some are rooted in aesthetic preference, some in memory, some in senses, some in musicality. In discussions during soundscape events and around installations, listeners can be encouraged to think in several ways about listening: musically — thinking about pitches, textures, rhythms; historically — thinking about other sound experiences in that place or the history of the place, how it did sound or would have sounded to people in the past; politically — thinking about which sounds are masked by others and which sounds dominate, and who is in control of the flow of sounds; mnemonically — thinking about memories that are evoked by sounds; evocatively — thinking about what other senses are activated by the sounds and the relationships between these senses. It is most exciting when these different ways of listening can be brought into dialogue with each other, creating an imaginary ecotonality, in which the different ways of listening can inform each other in the ways that they overlap and rub up against each other. Earlier I discussed hifi soundscapes as a search for authenticity of sonic representation. The theme of authenticity is one that I have thought about a lot during sessions in the last few days, so I want to end with some questions in relation to authenticity. Authenticity of place: what can we learn from a romantic or a nationalist landscape, and like Pessi Parviainen can we find ways to question that romanticism or nationalism sonically? (2) Is it important to know the name of each type of car that passes by? The names and histories of each machine in a factory? Or just the names of living beings in the place? How should the recordist collaborate with others, such as ecologists or historians, to find this information? Is it most important to document traditional soundscapes and cultures? Is it possible to create a poetic cartography of a domestic soundscape or a noisy urban soundscape? How does one represent a post-industrial quiet village such as Skruv? Do we celebrate the advent of a quiet soundscape or hear it as a desolate remainder? How do we approach traumatic soundscapes, and explore their silences, noises and emotional complexities? Authenticity of production: do all sound sources need to come from one local place? Should they be played back in that same place, or can they travel? Is schizophonia negative or can it be a bridge between places? What is the role of processing and what is our attitude towards processing of sound? Authenticity of connection: is there an ethics of noise, like the cassette noise that builds up through the passage of moslem sermons from hand to hand, or the noisy works of internet activists on the streets? What is our ethics of connection with audiences? Do we connect with them through performance, questionnaires, discussions, social media, audiovisual media? Do we suggest listening strategies to audiences, such as tactile listening, mnemonic listening, historical listening, psychoanalytic listening, political listening, extending thinking about listening beyond the familiar aesthetic? Do we imagine one acoustic community in each place, or a set of overlapping ecosystems? One sonic identity or a number of sonic identities? Do we recognize the soundscape competences of listeners? Lots of questions. I look forward to yours. (1) After this presentation, I was introduced to two additional references examining silence, sounds and repression: Acoustic Territories, by Brandon LaBelle (2010) and Dark Side of the Tune: Popular Music and Violence, by Bruce Johnson & Martin Cloonan (2009). (2) During the conference, Pessi Parviainen too us on a soundwalk on Koli mountain, which is known historically for its association with the nationalist romantic landscape movement in Finland. Cary, John. H. 1958. “France Looks to Pennsylvania: The Eastern Penitentiary as a Symbol of Reform.” The Pennsylvania Magazine of History and Biography 82 (2), 186-203. Devine, John. 2006. “Janet Cardiff & George Bures Miller.” ArtUS 15, 63. Dickens, Charles. 1996. American Notes. New York: Modern Library. Ferrari, Luc. 1971. Presque Rien No. 1. Deutsche Grammophon 2543 004, LP. Frye, Northrop. 1971. The Bush Garden: Essays on the Canadian Imagination. Toronto: Anansi. Gosz, James R. 1993. “Ecotone Hierarchies.” Ecological Applications 3 (3) 369-376. Keightley, Keir. 1996. 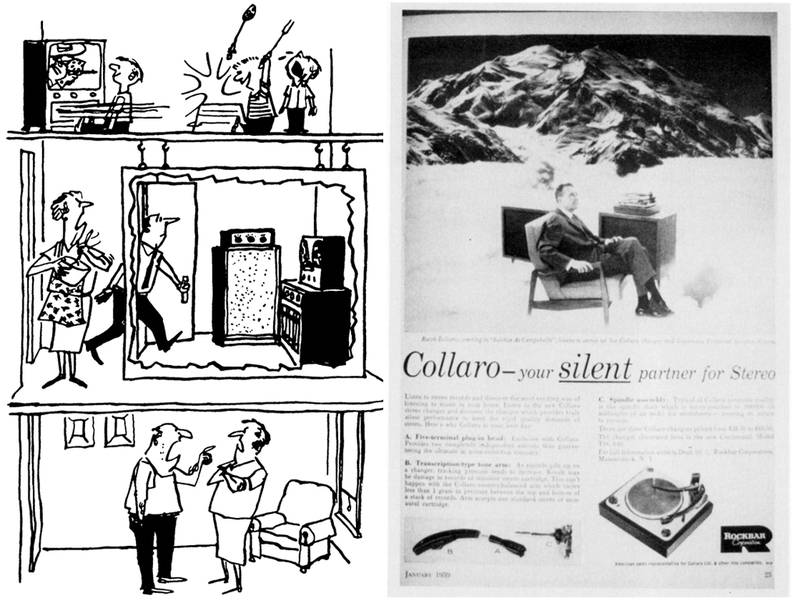 ‘Turn it down!’ she shrieked: gender, domestic space, and high fidelity, 1948-59. Popular Music 15 (2). Cambridge University Press. 149-177. Kuzniar, Alice. 1988. “The Vanishing Canvas: Notes on German Romantic Landscape Aesthetics.” German Studies Review 11 (3), 359-376. Manning, Peter. Electronic and Computer Music. 2nd edition, Oxford: Oxford University Press, 1993; 1st edition, Clarendon Press, 1985. McGregor, Gail. 1985. The Wacousta Syndrome: Explorations in the Canadian Langscape. Toronto: University of Toronto Press. Nicoletta, Julie. 2003. “The Architecture of Control: Shaker Dwelling Houses and the Reform Movement in Early- Nineteenth-Century America.” Journal of the Society of Architectural Historians 62 (3), 352-387. Rodman, Margaret C. 1992. “Empowering Place: Multilocality and Multivocality.” American Anthropologist (September), 640-656. Schafer, R. Murray. 1977. The Tuning of the World, New York: Knopf, republished in 1994 as The Soundscape, Destiny Books, Rochester, Vermont. Schmid, Muriel. 2003. ” ‘The Eye of God’: Religious Beliefs and Punishment in Early Nineteenth-Century Prison Reform.” Theology Today 59 (4), 546. Academic Search Premier. Thibault, Jacqueline. 1982. “To Pave the Way to Penitence”: Prisoners and Discipline at the Eastern State Penitentiary 1829-1835. The Pennsylvania Magazine of History and Biography, 106 (2), 187-222. Thompson, Emily. 2002. The Soundscape of Modernity: Architectural Acoustics and the Culture of Listening in America, 1900-1933. MIT: Cambridge. Tuan, Yi Fu. 1977. Space and Place: The Perspective of Experience. Minneapolis: University of Minnesota. Wilson, Alexander. The Culture of Nature: North American Landscape from Disney to the Exxon Valdez. Toronto: Between the Lines, 1998. Wrightson, Kendall. “An Introduction to Acoustic Ecology.” Soundscape: The Journal of Acoustic Ecology. 1 (1), 2000. Waves at Long Beach, Tofino (BC), Canada. Recorded by David Paquette in April 2004. Night jungle ambiance at night. Mae Sapok, Thailand. Recorded by David Paquette in May 2003. Day ambiance Cafe Calabria, Commercial Drive (BC), Canada. Recorded by David Paquette in March 2004. Link to MA thesis. Soundwalks at metro de la Concorde. Part of the Audioparc event at Galerie Verticale in Laval, commissioned by Magali Babin. I want to propose the notion of “balade sonore” as French translation for the English term soundwalk. Instead of “marche sonore” which seems a bit too military, or promenade, which evokes the idea of walking to show oneself, or even “dérive” in which like the Situationists one might seek to be completely lost or disoriented, I like the idea of “balader” … to do a “balade” –which has the same root in French as the word for song. A balade is also a way of slowing down. A balade is a bit vague. Not exactly lost, but not at all rushed. Slow, attentive, alert to all sounds, with all senses, all sensations. A balade sonore or soundwalk is a form of creation and method of research that utilizes listening and sometimes recording as a way to explore a place on foot. Each soundwalk can be considered in a musical fashion, as a mnemonic tool, or as a source of information about the environment. People’s listening experiences can become the point of departure for conversations that bring together the epistemological, aesthetic and ethical dimensions of the places where sounds are found, and these same dimensions can be found in the detailed reflections of participants in soundwalks, in listening sessions afterwards, and in reaction to artworks which come from soundwalks. There are many ways to listen. One can listen like a musician, thinking of the melodies, harmonies and rhythms of the sonic environment. One can create a musical piece out of the sounds heard. One can listen sensually, like a poet, linking senses — the touch of sound, the noises of images, the taste of a location. One can listen to sounds politically, thinking of which sounds mask others, which are more present, which dominate. Because we walk in a group, we can reflect on the internal dynamics of that structure. What can one hear of the group> Does this structure give our listening a certain dynamic or constrain it? One can listen historically to the place, thinking of the history of a certain place or culture, one can imagine its history, the people who lived there before, the sounds that are now gone, changed, or amplified. It is also possible to create imaginary bridges between different sounds, sonic resemblances that connect spaces separated in time and space, one place calling to another, echoing, producing an imaginary place in between that has characteristics of each. And one can listen as if listening to a lover. One can reserve a certain sort of attention, a certain kind of intent listening towards the sonic environment, which resembles the kind of listening that we do in the company of someone we love. With the Soundwalking Interactions project, we wish to concentrate our attention on the participants of soundwalks, and wish to talk to them about their different intentions and their specific responses to the sonic environment, their approaches to listening while moving through places. I walked in the area around Metro de la Concorde in Laval, several times between June and September 2012. Here are some comments on what I heard during those walks. Everyone loves the colour green. Close to the metro, there is a “route verte”, a cycling path that is also accessible to pedestrians. But I ask myself here, what does green signify in this context? A narrow asphalt laneway between barriers, cloistered between railway and parking lots, barriers of 2 to 3 metres in height, made of plastic and steel. Perhaps it is a green route just because of its very existence, a way that permits cyclists to quickly go from one place to another. But for pedestrians, who gain access only at street corners, there is no way out for long stretches, everything is closed off. Is this a green experience? Close to here, I stand under large electrical structures while late-summer insects sing in the weeds underneath. Many insects, signalling the end of summer and beginning of school. Buzzing like electricity. I think about the paths and what they might mean. There are ornamental paths that go nowhere, aesthetic paths of reddish stone that lead to a fence blocking the route or go round in circles. Will l listen differently on those paths? (self-consciously perhaps) Will my listening be more open or more linear, in between the lines? On escalators, rising and falling next to each other in the metro, is my listening directed by the rhythms felt underfoot? There are different modes of transport integrated here: train, subway, buses, cars, pedestrians, cyclists. Which are most important in the design of the metro? Who uses this place at what times? According to what I found, after the 9 am rush finishes, it is cyclists who pass through most in the morning, around the metro itself. A bit further off, the sound of traffic is constant. There is little movement in the parking area after rush hour. Pedestrians walk from one entrance to another, but few seem to frequent the pleasant sitting space with wooden walkways and benches surrounded by tall grasses and subway vents, near the metro door. I think of our soundwalk near the Metro as like a string of pearls, where each sonic moment is one pearl on the string. Moments of listening stillness, moments of group listening-walking, moments where we stand and comment on what we have heard. Each moment has a distinct ambience, made of the movements of the group, the sounds of the environment, other sensations, and the effects of the commentary. The de la Concorde soundwalk contained many of these pearls, each a few minutes long, held together by listening. Walkers spoke of the eerie quietness of the residential area nearby, the lack of pedestrians on the street compared with more downtown locations. Walkers also remarked on the long length of the blocks, made more on car scale than on pedestrian. The most ubiquitous sound on the soundwalk was that of cars (comme toujours!) Close to the metro, people remarked on the strange and other-worldly breathing and creaking noises made by the subway vents, sounds that we heard as well in the installation of Jen Reimer and Max Stein. The soundwalk was followed by a different soundwalk led by Eric Leonardson of Chicago, focused through interaction with stones picked up at the site, on the hill next to a vent (and replaced there afterwards). The group moved from one part of the site to another, clicking the stones to activate the architecture acoustically, at times conducted by Leonardson who asked different parts of the group to play to each other. Thompson’s most widely known and cited work is The Soundscape of Modernity: Architectural Acoustics and the Culture of Listening in America, 1900-1933 (2002). In the book, she examines changes to aural culture in the U.S. in the early twentieth-century. Thompson argues that modern technology changed the way people listened along with transforming America’s soundscape—i.e. what people heard. Thompson writes that during this period (1900-33), “sounds became signals,” positing that the “desire for clear, controlled, signal-like sound became pervasive, and anything that interfered with this goal was now engineered out of existence” (3). Moving away from Murray Schafer’s conception of soundscape and drawing on the work of Alain Corbin, Thompson defines the soundscape “as an auditory or aural landscape. Like a landscape, a soundscape is simultaneously a physical environment and a way of perceiving that environment; it is both a world and a culture constructed to make sense of that world” (1). This is the audio recording of a presentation at the WFAE international conference Ideologies and Ethics in the Uses and Abuses of Sound, Koli, Finland, June 19, 2010. In this presentation, I offer a reflection on the traditional notion of the soundscape, and propose to consider place as a research paradigm in acoustic ecology. Place and space have become prominent concepts in contemporary transdisciplinary research as well as fine arts. The work of French philosopher Gilbert Simondon also makes possible a reconsideration of the potential of sounds and sound practices to be considered as traces of the complex processes that create and shape place. I begin by looking at soundscape as a model of representation of the sound environment, and evaluate its ontological and epistemological basis. I then introduce the philosophical and geographical notion of place, and show its relevance to acoustic ecology as a research domain but also as a space of reflection on the role and reception of all sonic forms. Simondon’s concept of the milieu is also introduced, in a way to emphasize his understanding of the multi-dimensional and mediating nature of place, and the use of sound as an informational and structuring agent. Finally, I describe the sonic place and its theoretical and methodological potential, based on a number of recent and current research projects. Listening as a method of inquiry results in a particular ontological framing of the world, in which the researcher is always involved. But listening to a place necessitates a reintroduction of other senses in a way to make possible an understanding of sounds not just as acoustic realities but also as indicators, traces of a larger ecological but also ethical system to which they partake, or from which they result. The sonic place, by enlarging the range of issues and environments that can be explored and critically researched through sound, creates points of contact with other disciplines while providing acoustic ecology with a supplementary approach to deal with the increasing complexity of real and virtual sound worlds.